Uluwatu is a place where seaside cliffs plunge into the water, creating dramatic scenery that compliments the sky as it comes alive every night with colours. Uluwatu is white sand beaches, epic surfing waves, long nights with cocktails in hand and coasting along the rolling hills. 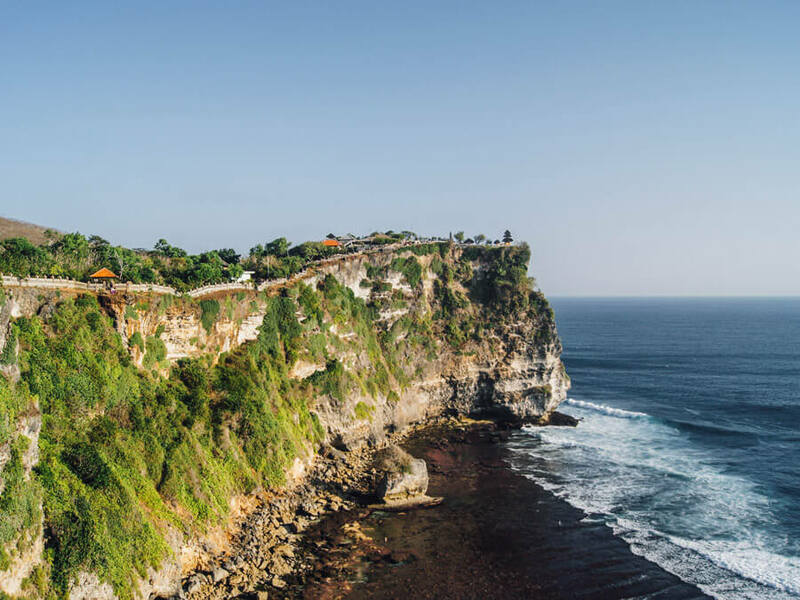 There are a number of things to do in Uluwatu that make this destination a highlight on everyone’s Bali itinerary. Uluwatu’s home is on the southern shores of Bali in the Bukit Peninsula beside Nusa Dua and Jimbaran. It’s home to cliffside resorts, a relaxed atmosphere and a whole lot of beaches. And though there may not be a ton of Uluwatu activities, the few that there are make Uluwatu incredible. A stay here will chill you out and leave you ready to explore more of Bali. All prices are quoted in Indonesia rupiah. Check up to date conversations here. 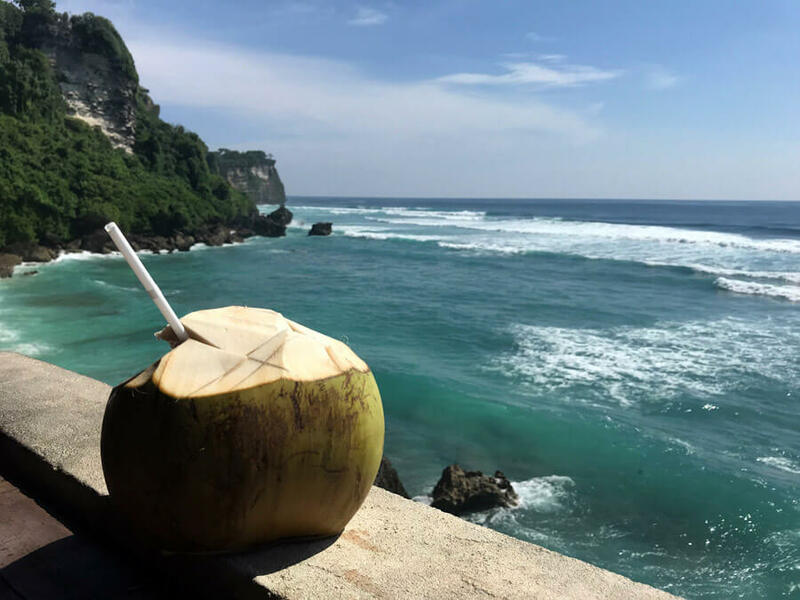 Enjoying the cliffs views with a coconut is one of the best things to do in Uluwatu. Uluwatu is a great destination to start your Bali trip in because it’s one of the closest destinations to the Bali airport. It’s a 45-minute drive and you have the option to find a taxi once at the airport or book a private driver to pick you up. Many places to stay in Uluwatu will help you organize a private driver and some even offer shuttles. Expect to pay 125,000 for a taxi or private car. From areas of Bali you can choose to take a taxi, hire a private car or use Grab, Uber or Go Jek (the Indonesian version of Grab and Uber). The price will vary depending on what area you are coming from but these apps offer significantly cheaper transport. Many drivers will try and argue the price with you for it to be higher but you can still get a good deal. Uluwatu is big and there is no way that you will be able to walk to almost any Uluwatu sightseeing spots. Unfortunately, private drivers run the area and are ridiculously expensive. But you still have options. The cheapest option is to rent a motorbike which cost 50,000 per day which can get you to all of the activities in Uluwatu. The roads in Uluwatu are smooth but there are plenty of hills and curves. You will have to pay for parking which is never more than 5,000. I highly recommend having experience before driving a motorbike in Bali. If you don’t want to drive you can use Grab, Uber or Go Jek for drop-offs for all places to see in Uluwatu. Many areas in Uluwatu do not allow drivers from these apps to pick up at the main tourist sites. Some accommodation options have shuttles organized that are affordable. Activated Charcoal: This is available in Bali too but when your tummy is not feeling so great and you may need to run to the bathroom at any second you’ll be happy it’s within arms reach. 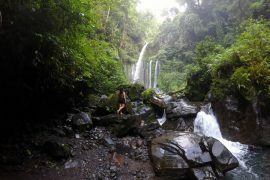 Bali belly (trust me) and these will help you get back to health and enjoying your vacay in no time. 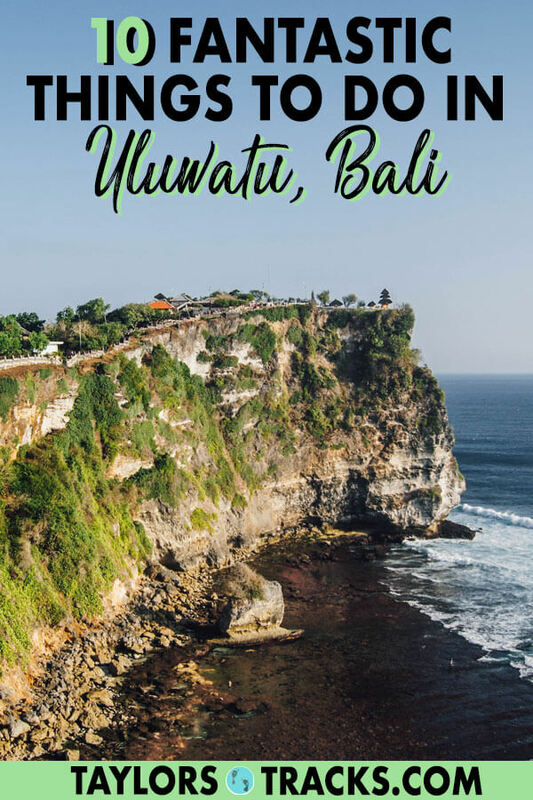 Find what to do in Uluwatu and what to see in Uluwatu to help you plan the ultimate Uluwatu itinerary. Uluwatu Temple is one of the main Uluwatu attractions. Uluwatu Temple is one of the most famous temples in Bali along with Tanah Lot in Canggu and Pura Ulun Danu Beratan near Munduck. Uluwatu Temple is one of the coolest things to do in Uluwatu as it’s one of the six key temples that are Bali’s spiritual pillar’s. The spiritual significance is not the only reason why you should visit this Balinese Hindu temple. It’s the incredibly scenic sights that you’ll get from the cliffs that draw visitors to this place. Uluwatu Temple sits on a steep cliff 70 metres above sea level overlooking the Indian Ocean. It’s also where you can catch an epic sunset. Beware of the monkeys here, they are seriously something else and are the worst behaved monkeys I have seen in all of Southeast Asia. Make sure you do not wear sunglasses (even glasses if you can manage) or jewelry. Don’t bring in plastic water bottles or food. I had a monkey jump on me here, a friend had her phone stolen out of her hand by a monkey and I even saw one try and take a guys flip flop right off of his foot! The Uluwatu Temple entrance fee is 30,000. The Kecak Fire Dance at Uluwatu Temple is a must-see of all the Uluwatu activities. A stop at Uluwatu Temple isn’t just in order to see the temple itself but also to see the well-known kecak ‘fire’ dance. Yes, there is fire involved. It’s not the fire that makes this Balinese dance so iconic though. It’s unique even to Balinese dancing because no music is used but instead human vocals from a large group of men as the dance is performed. Like all Balinese dances, it tells a story. 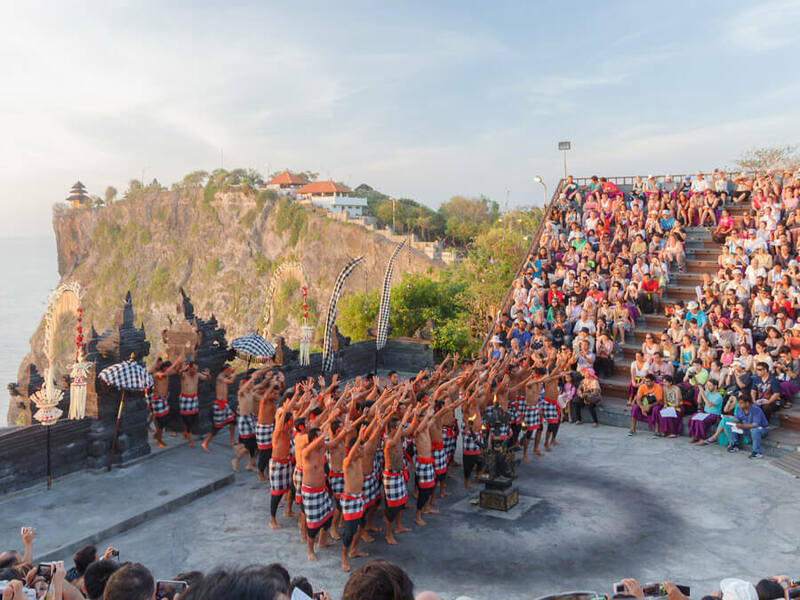 Watching the kecak dance in Uluwatu is the #1 place in all of Bali to see it, at the amphitheatre at Uluwatu Temple because you get to see an incredible sunset behind the performers. Uluwatu beaches are among the best in all of Bali. Many beaches charge entrance fees that typically range from 10,000-15,000. Sunset from Uluwatu Beach is always a stunner. 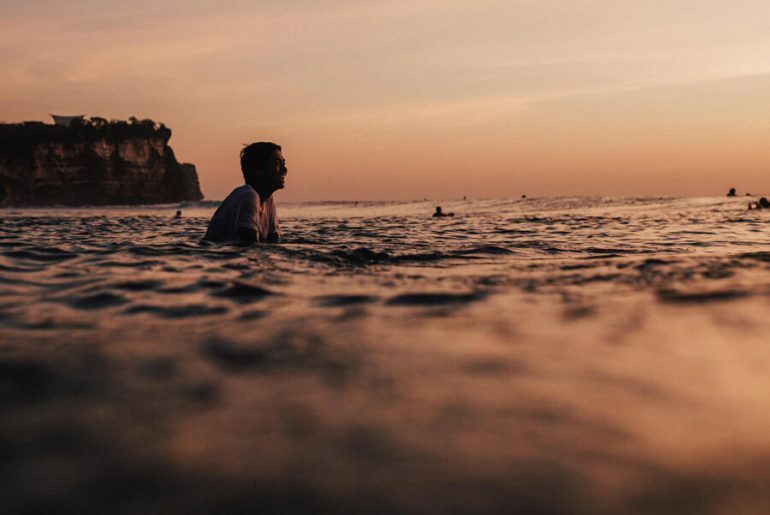 Easily another one of the top things to do in Uluwatu is sunset. 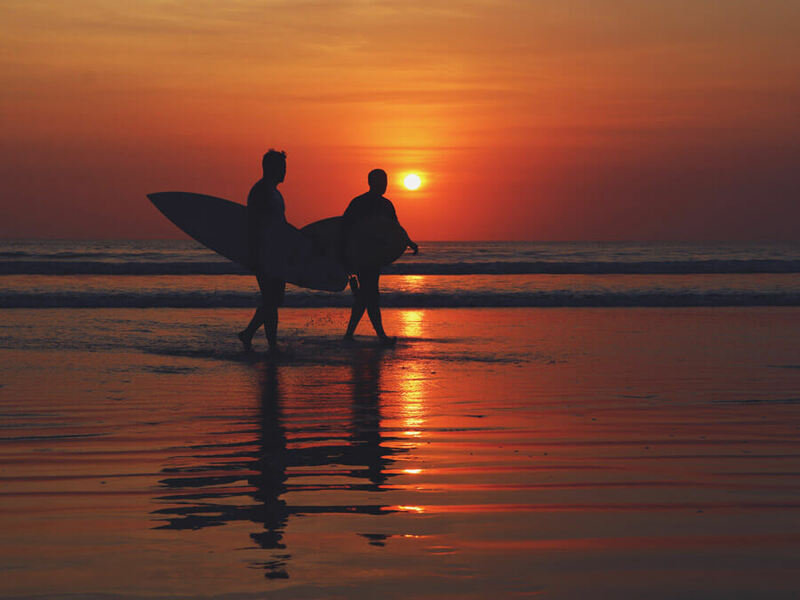 It’s one of the top places in Bali to watch sunset from, mainly because of its location on the southwestern coast and the steep cliffs that give you an amazing viewpoint over the Indian Ocean. For a unique sunset experience watch the Uluwatu Temple sunset. If you’ve been there and done that then a stop at Single Fin is in order so you can sip on a cocktail while watching the surfers hit the waves below as the sky explodes with colour. Some other stellar places for sunset are Rock Bar and Delpi Rock Lounge. 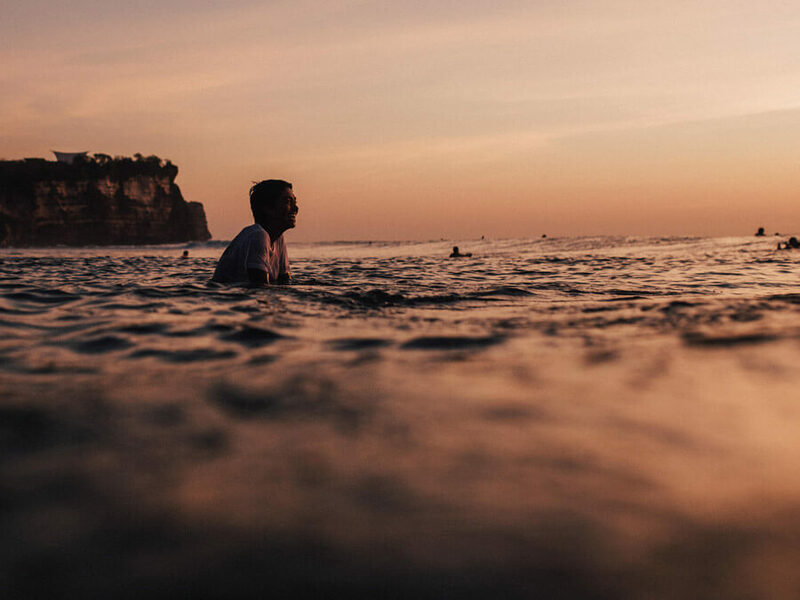 Single Fin in Uluwatu is the equivalent to Old Man’s in Canggu and is one of the best things to do in Uluwatu at night. It’s the top spot to party and Sunday’s are their biggest night. Single Fin beach club is worth visiting any day of the week though for sunset or to enjoy food and drinks overlooking the surfers. It’s a great view anyday and they’ve got awesome music, great food and delicious drinks. 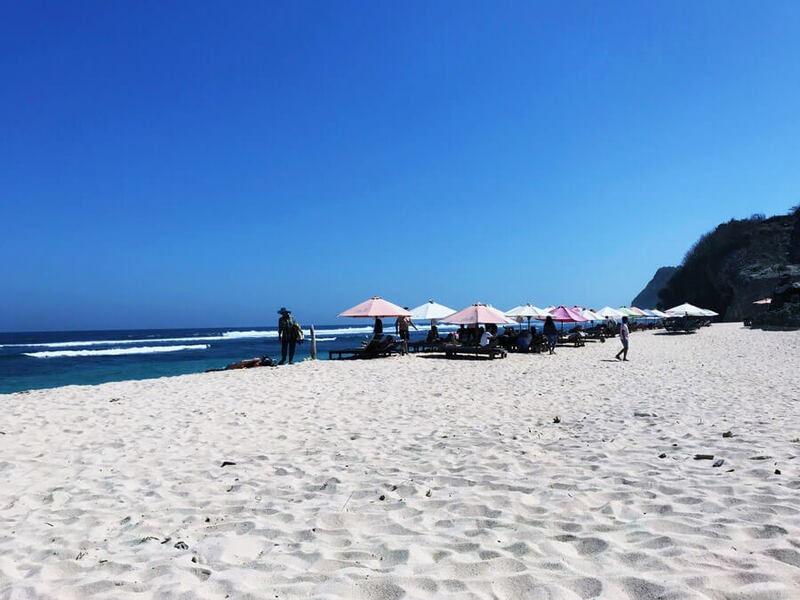 Suluban (Blue Point) Beach is one of the top places to visit in Uluwatu. 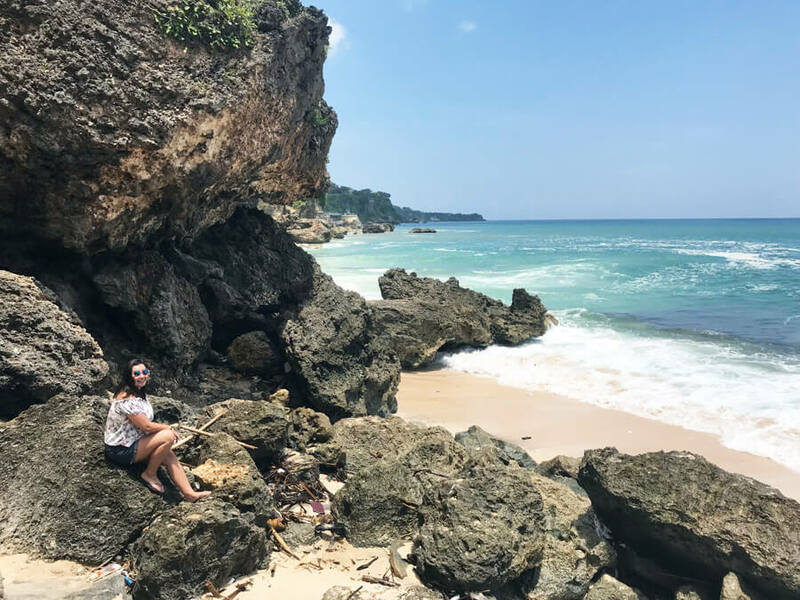 Suluban Beach, nicknamed Blue Point is not an ideal beach for sunbathers but a trip here is in order to see the cool cave that you have to walk through to reach the water. It’s a hot spot for surfers who use it as a point to surf out from into the strong waves. To get down to the beach you have to walk down many steps and work yourself through the limestone cave (more stairs lead you down). 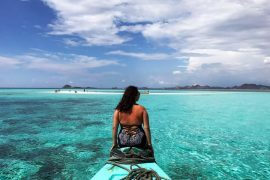 It’s an Instagram worthy beach, its cool to watch the surfers paddle out and if you walk up the steps on the opposite side then you’ll find yourself at a luxury beach club with a pool and local warung with epic coastal views. Green Bowl Beach is a secluded paradise for beachgoers who wish to have some solid beach time to themselves. Because getting to this beach requires walking down 75 metres of steep stairs down a cliff means that only those who are adventurous enough dare to go. If you choose to make the decent then you’ll be rewarded with a small 30 metre white sand beach almost to yourself. It’s best to go during low tide when it’s also best for snorkelling. 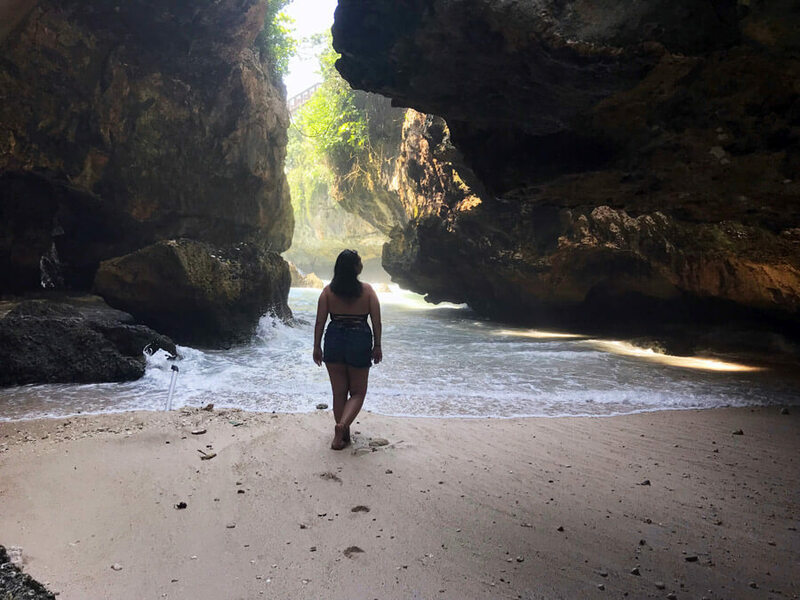 This beach is not very known by the locals, despite it being in a very obvious destination, just below the temple of the same name that sits atop the limestone cliff that rises up from the sand. It was kept secret for quite a while by wedding photographers for its scenic, rugged coastal views. 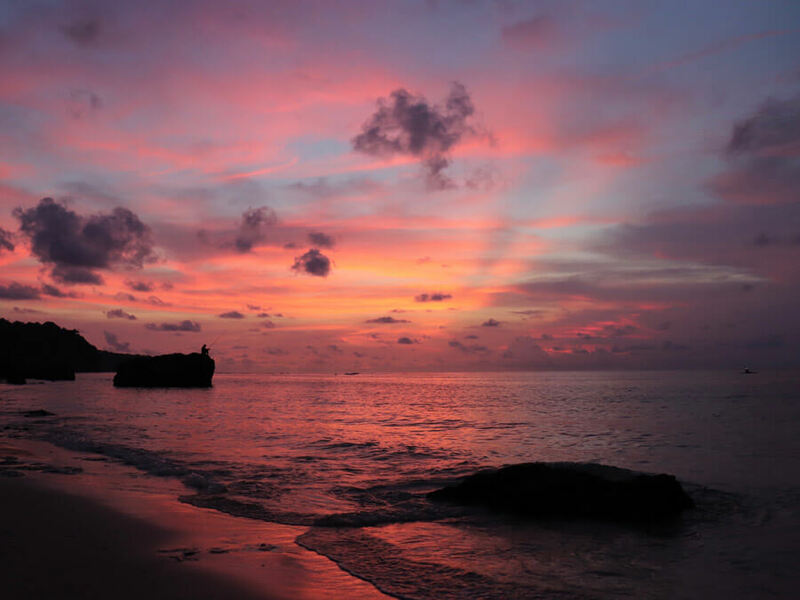 When you visit the beach make sure you check it out just before sunset during the ‘blue hour’ for epic sunsets and during low tide when the ‘jacuzzis’ are made accessible. Surfing is also one of the main attractions in Uluwatu. There’s even more places to surf, but these are just some of the top places to surf in Uluwatu. And things to do in Uluwatu at night always include dinner on the beach. Technically not in Uluwatu, Jimbaran Bay is close by and is a popular spot for people to enjoy dinner on the beach while watching the sunset. 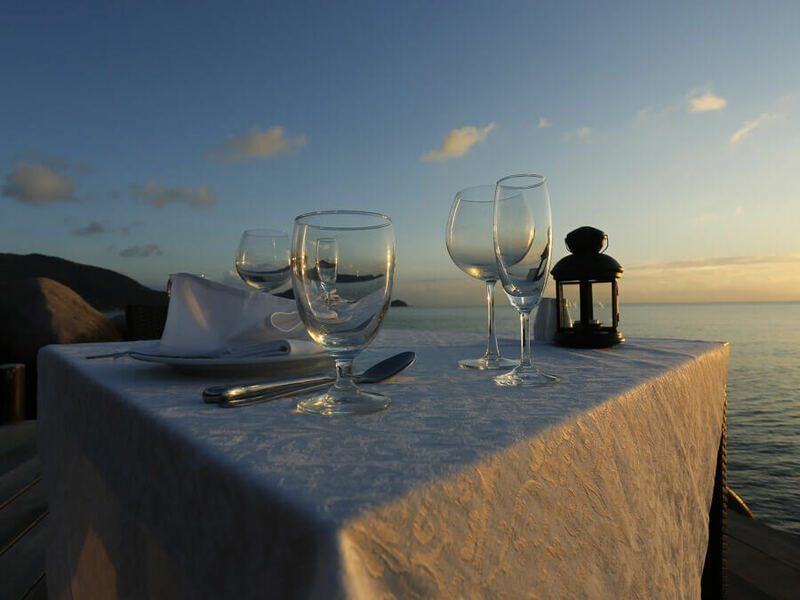 There are a number of restaurants to try and even tours will take visitors here for a stunning and delicious dinner. 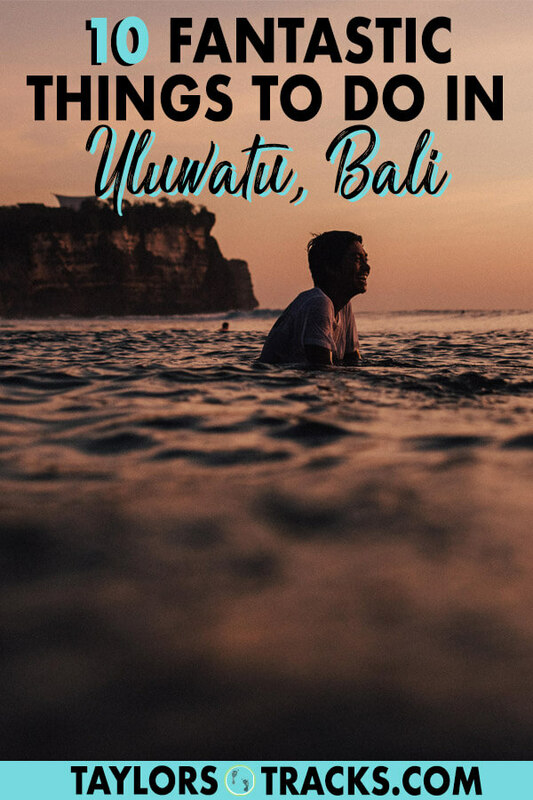 Read my detailed Uluwatu accommodation guide to find the best places from budget to luxury, hostels to hotels and villas. Enjoy your time in Uluwatu!